Preview of some of the exhibits relevant to gear manufacturing at the upcoming EMO 2013. 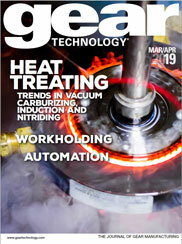 The complete Product News Section from the August 2013 issue of Gear Technology. It's hard to think of a show more essential to attend than IMTS. It's the cornerstone event for the industry, the center of the universe for a week, the one show to rule them all. The latest in big gear machining with DMG/Mori Seiki. Imagine the flexibility of having one machine capable of milling, turning, tapping and gear cutting with deburring included for hard and soft material. No, you’re not in gear fantasy land. The technology to manufacture gears on non gear-dedicated, mult-axis machines has existed for a few years in Europe, but has not yet ventured into mainstream manufacturing. Deckel Maho Pfronten, a member of the Gildemeister Group, took the sales plunge this year, making the technology available on most of its 2009 machines.